Programming note: Please join me tonight, Wednesday, for a full hour of guest-host-level semi-professionalism as I sit in for Tucker Carlson on Fox News, live across America at 8pm Eastern/5pm Pacific - with a rerun at midnight Eastern. Lots of breaking news today, so I hope you'll dial us up if you're in the presence of the receiving apparatus. As I said, spare a thought this morning for George Bush Sr on the first day in three-quarters of a century without the great love of his life. There'll be more to say about Mrs Bush and Comey, the SouthWest flight and Mike Pompeo's meeting with Kim Jong-Un and all the rest of the day's news, on tonight's show live across America. If "Fox & Friends" and "Tucker" aren't enough, there's another half-hour of me on screen, addressing the British state's war on cutlery and garden tools in a brand new SteynPost. It's an absurd glimpse of a critical issue, and I'm pleased to say it's ramping up a lot of comments. 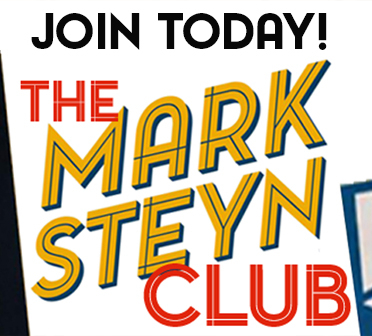 SteynPosts is made with the support of members of The Mark Steyn Club, for which we are profoundly grateful. We have fun in The Mark Steyn Club: for more info, please see here. And, if you know of a wee lad or lassie of a Steynian bent, there's always the perfect birthday present - a Steyn Club Gift Membership. See you on the telly at 8pm Eastern/5pm Pacific - with a rerun for West Coast types at midnight Eastern/9pm Pacific. Susanna and Fran--I agree completely with your comments. Sorry, I can't agree. Barbara Bush supported the wanton killing of unborn babies. It's a real sticking point, you're right to mention it. I just thought it was a day to say something appropriate, something that emphasized the role modeling she did. But you're right about her position being not exactly pro-life. But she said what she thought regardless of others' opinions and I'll model that part and say that I believe abortion is wrong. How ghastly. The Bushes are well-bred liberals in disguise. They have a great sense of noblesse oblige and are kind and amiable--unlike a their contemporaries. The Mrs. Bushes weren't activists, though, and haven't been "in your face" with their opinions. As First Ladies go, that's a credit to them. Very touching about her early graying. I hadn't known that. I admired the nondescript, traditional clothing and pearls and her dignified and understated presence on the political and cultural scene. Brava, Mrs. Bush, and RIP. Melania is an admirable and discreet First Lady, as well. In contrast to Barbara and Laura, however, every time I see pictures of her, I feel the urge to shop! What a wardrobe. Barbara Bush was a FIrst Lady I admired a great deal. Both Bush First Ladies, Barbara and Laura have been role models of courage, dignity and loyalty for me as a mother and wife myself with a young growing family in the last couple decades of the past century. Rest In Peace Barbara Bush. Know what? I WILL be one of those people who wishes they'd spent more time at the office (or in my case, my home office computer.) :-) Work is life. Thank you for saying that, Kathy. I will too. There is one verdict I didn't get that will still be engraved on my heart, the way "Calais" was on Queen Mary's.